Pie chart are a popular method to show data through percentages. In pie chart you contribute the data in all amount correctly through percentages. If you do not know how to draw pie chart in excel, powerpoint and word then follow these methods carefully. Goto Main-Menu tab, and click on "Insert", and then click on Chart. Note: If your screen resolution are low, then the charts icon are appear small. In the "Insert" menu, click on Pie and then 2x Click (Double Click) on the pie graph/chart you want to use for your purpose. And then the spreadsheet appear on your screen, then type or write all the data correctly you want to appear on the pie chart. When you give all the data correctly in the pie chart then close the spreadsheet. If you want to hide or show the entered data in your chart,then click the "Chart Filters". If you want to hide, show, or format things like data labels or axis titles, then click the "Chart Elements". 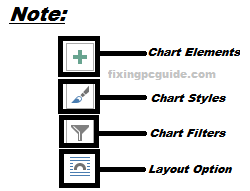 If you want to arrange the text and chart in your documents, then click on the "Layout Option". If you want to quickly change the style or color of the chart , then use the "Chart Styles". Click on Insert Button present in the "Main-Menu" tab. In the insert menu, click on Doughnut or Pie Chart.Then choose the chart you want to use for your purpose. First of all, click on the Insert present in the main-menu tab. In the "Insert" menu, click on Pie and then 2x click on the pie graph/chart you want to use in your slides. After reading this post, I hope you learned how to create pie chart in excel, word and powerpoint.